Today I have a special interview for you with my copyright attorney, Erin Moore, where we discuss what copyright actually is and why you should consider thinking a little more about it than you have been to date. What is copyright, and why is it relevant? What is protected by copyright, and what isn’t? When does it make sense to register your copyright? Is the process any different between published or unpublished works? Can authors register copyright themselves, or do they need an attorney to do it for them? How is copyright handled when multiple creators are involved (illustrators, forwards, anthologies, etc)? How do you register your copyright? After the interivew, we sat down and put together a cheat sheet for when you might want to consult with an attorney before registering your copyright and when you would want to register it yourself or just rely on the implicit registration you get from creating the work. You can get that flowchart by clicking here. Welcome to today’s show. I’m your host, Blaine Moore. Today I have a special interview for you with my copyright attorney, Erin Moore, where we discuss what copyright actually is and why you should consider thinking a little more about it than you have been to date. Our conversation touched on what copyright is, why it’s relevant, and whether it’s worth registering or not. We also talked about how copyright can affect the works that involve multiple creators, such as when you hire somebody to do illustrations for you or if you put together a collaborative work such as anthology or other collections. 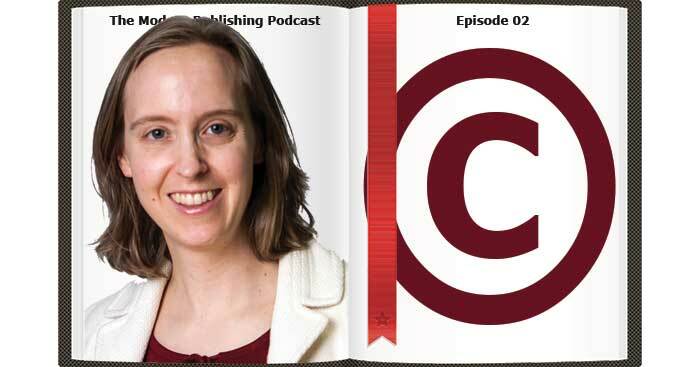 After the interview, I sat down with Erin and we put together a special gift for you for listening to the show, so stay tuned after our talk for details about how you can get it, and now, here’s our talk on copyright for authors. Blaine Moore: Welcome to another episode of the Modern Publishing Podcast. Today I have with me Erin Moore. She’s the principal attorney at JE Law Associates. She is a business attorney, and one of her areas of practice is in copyright. So today we are going to sit down and chat with her about what it is, and why it’s relevant, and what we can do to protect our works, and whether we need to or not. So welcome to the show, Erin. Erin Moore: Hi Blaine, thank you for having me. Because I understand this is a podcast geared toward authors, I’m going to keep this discussion geared toward the written work, although most of what I’m telling you also applies to artistic works such as photographs, drawings and sculptural work. I think some of it also applies to architecture, but we’re going to stick with the written work today. Blaine: So let’s start out, what exactly is copyright, and how is it relevant? Erin: Well, copyright is actually a bundle of rights that are geared toward protecting your work and keeping other people from unfairly using your creative works. The bundle of rights includes the right to distribute your creative work, that means to sell it or to give it away if you’re giving it to the public at large. It includes the right to reproduce, that means either make copies or create it in a different format, or create derivative works like adaptions, or for example, taking your novel and turning it into a screenplay, or creating an audiobook out of your novel. It could also include things like translating it into a different language. It also includes the right to perform or display your work. Performing means, for example, if you’ve written a play, the right to have that play performed in a theater, and display could include simply the right to use or put your book in a bookstore, or to put it on the internet. It’s important for you to know that the rights involved can be split up and sold off separately. So for example, you might be working with a publisher and you might split up the right to distribute from the right to create derivative work, so your publisher would have the right to sell your book in the United States, for example, but wouldn’t have the right to then create a screenplay of that book without coming to you to obtain those other rights. Also, occasionally, you’ll find that those rights can just be split by a geographic boundary, so, for example, a publisher might have the right to distribute in the US, and then a different publisher might have the right to distribute in Europe. Blaine: Yes. So what is actually protected by copyright, and what isn’t? Erin: Well, that’s a good question, and in order for it to be protected by copyright, it has to be a tangible and original expression. It has to be fixed in some sort of tangible medium, which means something from which your work can be read or heard, either directly or with the aid of some sort of machine like a CD player. But your thoughts themselves, your ideas themselves cannot be protected. So in other words, what’s protected is what you have written down or otherwise recorded, but not simply the thoughts that you may have discussed with somebody else. They have to be original, which means that they can’t be copied from someone else’s work, and there has to be some level of minimal creativity, and what I mean by that is you have to put in some thought process to how the wording is created or how the ideas are laid out. Just to give you an example, it has been ruled that a phonebook does not contain enough creativity to meet the minimal creativity standard, even though there are some ordering to a phonebook, it’s done in alphabetical order. There’s very little need for creativity in doing that, and that has been found not to arise to the level of creativity to obtain copyright protection. As I said, ideas, methods and systems, those are things that are not copyrightable, and also facts, in and of themselves, are not copyrightable. We can’t allow people to have a monopoly on facts. People need to have an ability to obtain facts, to read facts, and to reuse those facts in new and creative ways. In addition to that fact, facts aren’t anything that we’ve independently created so there’s really no creativity involved in facts. Finally, words, names, titles, those types of things cannot be copyrighted. So the title of your book, for example, is not enough of a creative work in order to be copyrighted in and of itself. Blaine: So you said that the actual expression is what’s copyrighted, but what about if you have a fiction book that has specific characters or specific world? Are those characters then usable if somebody is writing their own stories about them, or no? Erin: Well, that would depend on how much they transformed that character into a new and different creative work. If the character you’re taking from your book or your world that you’ve created in your book appears almost identically in a new book, to the way you’ve created it, that would be an infringement of your copyright. However, the fact that you’ve created a character, let’s take, for example, a private investigator, and you’ve dressed the private investigator in a trench coat and a top and a rain hat, that’s a very common character in literature. The fact that you’ve created that character in your book doesn’t mean that you can keep anyone else from creating a similar character. One thing that you can know and put in the back of your head is that if you’ve created a world or a specific character that is a very strong character, you can look at the option of protecting that character as a brand of your writing through the trademark world. That’s a topic for a different conversation, but there are alternative ways to protect and ensure that no one else is using your world. Blaine: Okay, so somebody could make similar characters in a similar world, but they can’t have them as the exact same characters in the exact same world even if it is an original story. Erin: Correct, they can’t take the same exact character that you’ve created using the same dialect, the same speech patterns, the same descriptions, and simply reuse those in their own world or in their own book. Blaine: Right. So now, what is the copyright notice, and when do you need to use it? Erin: Well, before 1989, a copyright notice was a necessary component of obtaining copyrights, however, in 1989 the Copyright Act of 1989 removed that requirement to obtain a copyright. Now, currently copyright occurs upon creation of your written work. So once you have written your work, you already have a copyright. However, copyright notices are still important for several reasons. For those of you who are writing today, it’s still a good idea to include the copyright notice because no one can claim they didn’t know your work was copyrighted. Understand that not everyone is looking into copyright laws, and so they may not know that a copyright occurs upon creation of their work. So if you include a notice, there can be no claim of innocent infringement. Erin: That does. You would have to weigh whether putting a notice of copyright on your notebook lying on your desk is worth your time, but yes, in principle that’s how it works. Blaine: So when does it make sense to actually register your copyright? Well, there are still really important reasons to register. First, you would need to register your work before you could sue anyone for infringing on that work anyway. So you would need to do it at some point if there was an infringer out there. But secondly, you want to do it right away, and here’s why, if you register your work within three months after publication or before any infringing activity begins, then you can obtain what are called statutory damages. Now, statutory damages are far-ranging from $750 to possibly $150,000, and attorney’s fees potentially, and that’s on a case-to-case basis and a judge will decide it. Now, the reason that it’s important to have these options are that if you have not registered for more than three months or by the time the infringement begins, you have to prove what you’ve lost by the infringing action. Those are what you’re damages will be so that’s what you’ll be awarded by the court. Damages are often very difficult to prove in a copyright case because it takes into account how much money the individual when infringed made off of your work, how much you have made off of your work, how much you would have made off of your work but didn’t’ make because some infringed on your work. As you can imagine, that’s a difficult analysis. But probably the most important thing for most of us writers to think about is that a lot of times, especially in our early stages of our careers, there may not be that many actual monetary damages, and our damages that we suffer from the infringement is often more loss of building ourselves as a professional, as a brand, as an author, and the personal damages, the personal feeling of betrayed and of having to police ourselves in our works. So it’s important still to go out there and register the works that we create, and you should do it within three months after publication. If you do it in three months after publication, even if someone has already infringed on your work, you still have that statutory damages window open to you. If you don’t do it in three months after you’ve published, you need to do it before the infringement begins in order to get your statutory damages. You can also register unpublished works. You might do this as, for example, you are giving copies of your work to other professionals to review for you, and whether you do that or not would depend on your relationship with those people and their understanding of your business as a writer and their understanding of copyright laws. Blaine: So if you register an unpublished work, would you then need to re-register it once it is published or would the unpublished version be good enough? Erin: Well, that’s a good question, you would want to re-register if you made significant changes between the unpublished but registered version and the version you ended up publishing, and that is so that you can protect the entirety of your work. If you made significant changes and did not re-register it, what would be protected would be the pieces of your published work that had been in place before you registered the first time. Blaine: So is the process any different if it’s an unpublished versus a published work? Blaine: Okay, how difficult is it to register the copyright? Is this something that authors can do themselves, or should they hire an attorney or when would they want to do one or the other? Erin: That’s a good question, and it depends a lot on the nature of your work that you’ve created. Let’s say, for example, you’ve created a novel and that you own the copyrights to the entire work. That could include illustrations that are within the novel that you’ve created or on the cover. All of that stuff, if you own the whole thing, you can fairly easily register the copyright yourself and there is an online application that I recommend because it is a little bit less expensive than filling out the forms and sending them in. You can find the online application at the Copyright Office website, which the USCopyright.gov. Blaine: We’ll include a link in the show notes at ModernPublishingPodcast.com/2, so you’ll be able to find the link right there. So if somebody does have illustrations and they register that, do those get registered as part of the book or is it a separate process? Erin: Well, if you own your own, if you have created the illustrations and the written work yourself, then they will all be one. Typically, they ought to be in one document, although there could be reasons why you might register separately, but typically there will be all one copyrighted work. Blaine: What if you have the illustrations outsourced, if you hire somebody to do them? Erin: Well, then you’re looking at an analysis of whether the illustrations were created as a work for hire. In other words, if you were sort of deemed their employer or if the agreement was such that the copyright is to be owned by different people, and that is a circumstance in which you would probably want to contact an attorney and review the agreement that you have with your illustrator or photographer whomever you use to create your artistic works within the document. It’s a good idea actually to discuss your intent to engage another individual before you go ahead and do that with an attorney just to make sure that what you want to occur is actually what has occurred and what will occur with respect to that copyright. Blaine: Okay, now, what about for a nonfiction book or something where there are other contributors where it’s your book, but you might have, let’s say, a guest chapter or an introduction or foreword or something along those lines? Erin: Well, typically, they can all be registered at the same time. The whole work can be registered at the same time. However, it is a little bit more of a complicated situation, and I would recommend speaking with an attorney about that. Blaine: Now, can you copyright something if you are, let’s say, an editor and you’re compiling, but basically you’re don’t have anything in there that’s your own or maybe you have one chapter but the majority of the book is something that has been contributed by other people. Is that something that you can copyright or not? Erin: You can. The situation is that there could be several different copyrights within that one book because you’re talking about the individual articles by the individual writers and then they’re talking about a compilation of all of those works typically by the editor. You might be talking about a foreword. You might be talking about other items within there. You might be talking about cover work as a separate piece. So there could be a number of different copyrightable elements within that book, and a lot of how you go about registering it and about who owns what will depend on what your agreements were at the time you set forward to make this piece, this book. Blaine: So chances are pretty good you wouldn’t be able to just go through the standard process of registering it as a book. You would probably need to do something separate. Erin: Well, you may be able to register it as a book, and then individuals may also be able to register pieces of it. It’s a little bit more complicated than a regular book so you probably would want to talk with someone about that. It’s important to know that on the application itself, there are places to differentiate different authors within the application, and so that could be an option. Blaine: Okay, so if you have a relatively simple book, you wrote it start to finish, you created all the illustrations or have them work for hire, what would the actual process be? You said that there’s a website that they go to do the registration. Erin: Yeah. You go to the website and you fill out the application which is fairly simple, but then you need to provide them with two samples typically, sometimes three depending on your work, and so these are samples of your work. It must be the best sample you can provide. So if your work is totally an electronic work, then you simply submit an electronic copy of your work because that’s your best publication of the work. You can do that right on the application. You simply attach it. If you have a book cover and your best representation of your work is in the hard copy book, you need to send copies of those books to the copyright office, and when you’re completing the application, they provide you with a shipping label that you include in your package, and that allows the office to connect your physical package of material with your application that you’ve already completed online. You can use the book shipping method from the US Postal Service, but if you are facing an infringement and you need to register immediately or you’re facing the end of your three months and you need to register immediately, you need to get them there as quickly as possible and you need to choose a different shipping method. Blaine: So that would be based upon the date they receive the books, not the application date? Erin: Typically, the application isn’t considered completed until the day they receive all of the materials. Blaine: Okay, now, if you have a book and you’re selling a physical version and a digital version, for example, a Kindle book or an iBook or something along those lines, would you be able to register the electronic version if they’re pretty much the same, or would you have to do them both separately or do them together? Erin: I believe at this time the copyright office is still considering that your best publication is your hard copy one, so you still have to provide them with that. Blaine: All right, well, thank you for coming on today and answering some questions. If you have any questions for Erin or are interested in discussing your book with her, then what’s the best way for people to get in touch with you? Blaine: All right, thank you very much for coming on. Erin: Thank you. It was nice to talk to you. I want to thank Erin again for coming on to the show today. If you visit this episode’s show notes at ModernPublishingPodcast.com/2, we sat down after the interview and put together a cheat sheet for you that covers when you might want to consult with an attorney before registering your copyright, and when you’d want to register it yourself or just rely on the implicit registration that you get from creating the work. The link for this flow chart is available on the show notes, so just visit ModernPublishingPodcast.com/2 for details and for links to other topics that we’ve covered today. For a quick topical addition, since this show was recorded, the US government has shut down so the copyright office is currently closed as this sub-episode is being published. The website is also down, although you can supposedly still register online if you already have a login and password. However, your registration is not going to be processed until after the government gets its act together.